The 2012 dodge avenger electric vehicle qualifies for a federal tax credit of up to $7,500, effectively reducing the net base price. The 2012 Dodge Avenger sedan is designed to compete with the Honda Accord, Chevy Malibu and Hyundai Sonata. The Avenger platform was remade last year, with a more aggressive look, and improved suspension and drivetrain and a vastly improved interior. 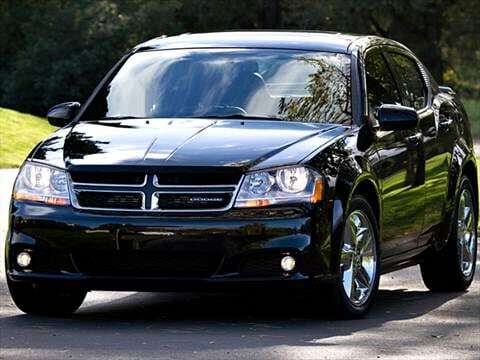 On its own, the 2012 Dodge Avenger sedan has some redeeming qualities worthy of consideration. Its new Pentastar V6 engine is one of the best V6s we've tested, and its newfound athleticism makes the Avenger a fun car to have when taking the long way home. But, with newer, larger sedans such as the Kia Optima and Hyundai Sonata offering equal or better pricing on comparably equipped models, finding a reason to opt for the Avenger over any of its competitors will probably come down to a matter of personal taste. If you're looking for a sedan with an American muscle-car attitude, but you can't quite swing the big bucks for the Dodge Charger, the 2012 Dodge Avenger sedan makes a good second runner-up. If you're looking for a more modern design, feature-rich standard equipment list or a manual transmission, there are newer and more modern cars from which to choose. If resale figures are important, you'd be far better off in a Honda Accord, VW Jetta, or Hyundai Sonata. The 2012 Dodge Avenger sedan gains a new R/T performance-oriented trim. The old trim names (Express, Mainstreet and LUX) are dropped in favor of the more familiar SE, SXT, SXT Plus and R/T names. The 2012 Dodge Avenger sedan is a surprisingly fun car to drive. Last year's complete reworking of the car's suspension, brakes and steering gear make the 2012 Dodge Avenger sedan perform much more like a nimble European VW or Opel than any mid-size Dodge we've driven in the last decade. But, unlike many sporty cars that punish the pleasure of excellent handling with the sin of a harsh ride, the 2012 Dodge Avenger knows no such unpleasantness. Dodge has managed to blend a soft comfortable ride with a responsive chassis that can carve up twisting mountain roads as easily as it floats over long freeway stretches. The Avenger's 3.6-liter Pentastar V6 is the most powerful V6 engine in the mid-size segment and it delivers enormous power reserves all while operating as smooth as glass. The 2012 Dodge Avenger sedan uses a 4-speed automatic transmission on 4-cylinder cars, and a 6-speed AutoStick automatic transmission on cars equipped with the V6. While it's fun to shift your own gears, the AutoStick is not as quick or precise as some newer dual-clutch transmissions. But, as the automatic does an excellent job of finding and holding the correct gear, we don't think you'll miss the manual-shift feature in the long run. This optional hard-drive-based system includes navigation with real-time traffic information, MP3/WMA music and JPEG image uploading via a high-speed USB port, auxiliary audio input, voice recognition, voice message recording and playback, Bluetooth hands-free cell phone connectivity and more. Quite possibly one of the best V6 engines ever produced, the new Pentastar V6 pulls like a V8, purrs like a Lexus and returns impressive fuel economy. If the 2012 Dodge Avenger sedan can trump its competitors in one area, it is with its interior design and materials. Where so many sedans offer dull gray and flat black fabrics, the 2012 Dodge Avenger sedan is peppered with soft-touch panels, interesting color and fabric patterns and supportive front seats. Nowhere is this attention to detail more evident than on the new R/T trim, which receives unique striped seats with leather bolsters, a revised gauge cluster with center tachometer and SRT-inspired brake and accelerator pedal pads. Extensive use of insulation helps give the 2012 Dodge Avenger sedan one of the quietest cabins in the segment, a silence easily pierced by one of the many audio options that include a 6-speaker Boston Acoustics upgrade and a navigation radio with a 30-gigabyte hard drive capable of storing up to 4,250 songs. With a somewhat aging profile, the oddly familiar 2012 Dodge Avenger's new look is primarily due to its revised front and rear fascias, new wheels and new paint colors. The familial Dodge cross-hair grille and aggressive lower air intake signal the Avenger's sporting intent, as well as link it to Dodge's other performance sedan, the Charger. LED taillights and an available rear spoiler round out the 2012 Dodge Avenger sedan's look, which we think becomes progressively better in the higher trim levels. More aggressive 17- and 18-inch alloy wheels can be found on the SXT and R/T trim, but even the base SE comes with 17-inch steel wheels with handsome covers. A 2012 Dodge Avenger SE features a 2.4-liter 4-cylinder engine, 4-speed automatic transmission, CD/MP3 audio system with auxiliary input jack, steering wheel-mounted audio controls, air conditioning, power windows/locks/mirrors, remote keyless entry, cruise control, height-adjustable driver's seat with manual lumbar support, tilt/telescopic steering wheel, 17-inch steel wheels with plastic wheel covers, 60/40 rear seat with pass-through and folding armrest and a security alarm. Standard safety equipment includes anti-lock brakes (ABS), electronic traction and stability control and front, front-seat side-mounted and side-curtain airbags. The highlight of the 2012 Dodge Avenger sedan's optional equipment list is the comprehensive Uconnect navigation, entertainment and communication system. Other standouts include a 6.5-inch touch-screen CD/DVD/MP3/HDD radio with 30-gigabyte hard drive (standard on SXT Plus), Voice Command and USB interface, Sirius Satellite Radio, Boston Acoustics speaker package, Bluetooth cell phone connectivity with streaming audio, 8-way power driver's seat, automatic climate control, auto on/off headlights, heated front seats, leather seats, remote start, 18-inch wheels and a power moonroof. The 2012 Dodge Avenger midsize sedan's base 2.4-liter "world gas engine" has been given numerous upgrades to help it perform better and with less noise, vibration and harshness. Producing 173 horsepower, the 2.4 liter is not the most powerful in its class, but at least it can now keep up with the pack leaders. The real star of the Avenger lineup is the newly minted 3.6-liter Pentastar V6, which produces an impressive 283 horsepower yet returns highway fuel-economy figures around 30 mpg. The 3.6-liter engine is also E85-compatible. The 2012 Dodge Avenger SE sedan has a Manufacturer's Suggested Retail Price (MSRP) starting just under $20,000. The SXT starts around $22,500 and a fully loaded SXT Plus with navigation and V6 engine bumps the price closer to $26,500. Our Fair Purchase Price reflects real-world prices others in your area are paying for the Avenger, so be sure to check it out before you buy. The Ford Fusion and Nissan Altima, two performance-themed competitors, start for about the same amount of money, but don't offer the same standard feature content. The Hyundai Sonata costs a bit more but offers more features and a larger cabin, while the Chevrolet Cruze costs less but is somewhat smaller. Compared with category leaders like the Honda Accord, Toyota Camry and Nissan Altima, the Avenger's higher feature content at any given price is countered in part by lower projected resale values.